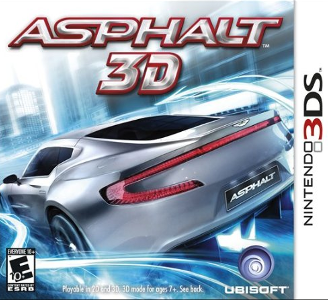 Asphalt 3D, released in Japan as Asphalt 3D: Nitro Racing (アスファルト 3ディー: ニトロ レーシング), is a racing game published by Ubisoft (Konami in Japan) and developed by Gameloft, in which the player must maneuver an automobile to compete against computer-controlled drivers on various race tracks. Players earn rewards such as car upgrades and XP points for winning races throughout the game, and reaching higher levels allows them to use better sports cars to unlock. Asphalt 3D has some problems in Citra. Graphically, the game suffers from minor issues, but requires powerful hardware to obtain decent speeds. It may suffer from minor audio issues at time, but this does not hinder gameplay in any way. You may experience slow down when booting the game and when there is a lot of on screen activity.